Celtics player Al Horford is greeted by middle school students from Lawrence and North Andover. The story of this year’s Boston Celtics is the team’s major overhaul during the offseason. Only four players remain from last year’s 15-man roster. To compound the challenge of such overwhelming change, the newcomers are like a miniature United Nations, with players from Australia, Egypt, Germany, and France. 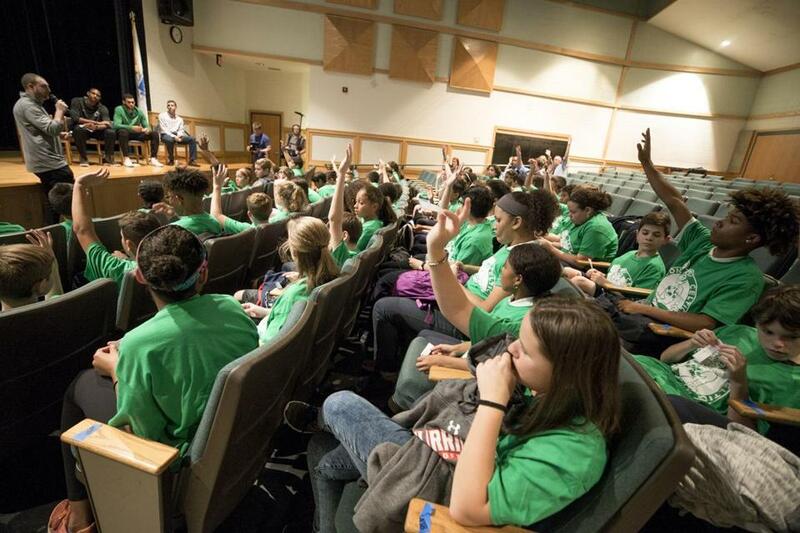 “How many of you have heard the word ‘diversity?’ ” asked Dave Hoffman, the Celtics’ senior director of community engagement, at a recent visit with a group of middle schoolers in Lawrence. This year, the Celtics are developing an outreach program to engage student leaders in diversity training and conflict resolution, and the National Basketball Association is looking at the initiative as a model of its kind. Over the course of several sessions this school year, Celtics coach Brad Stevens and several players, including Al Horford, Marcus Smart, and Abdel Nader, will meet for workshops with 60 students, 30 each from Lawrence and neighboring North Andover. Together the group will create a “playbook,” a set of guidelines in response to bullying, stereotyping, and other problems that the young students – and the Celtics – say they’re eager to confront. While the NBA has been doing community relations work for years, the new Celtics initiative is being commended for its forward-thinking design. Like the Celtics’ roster, the student leaders chosen from two disparate school systems — the Lawrence schools are 92 percent Latino, North Andover is 77 percent white — are expected to learn to work together toward a common goal. Hoffman, who oversees roughly 200 community events each year — hospital visits, programs that encourage literacy — is as good at working a roomful of wide-eyed young fans as Kyrie Irving is at carving up a defense. But he says it’s the coach and players, with help from the nonprofit Play Ball! Foundation, who have really devised the playbook program. During a break, Miguel Vazquez, 15, of Lawrence introduced himself to the boy sitting next to him, Colby Muse, 12, from North Andover. Miguel’s favorite sport is baseball, he said, but he’ll play anything. The NBA has a “respectful, mindful tradition,” said Kathy Behrens, the NBA’s president for social responsibility and player programs, one that dates back to great players such as Bill Russell and Kareem Abdul-Jabbar, who are committed to social justice. Over the years, the NBA has put particular emphasis on community relations and positive visibility. “We’re trying to make sure we’re having the right conversations,” Behrens said. Other franchises are working on their own programs: the Milwaukee Bucks, for example, recently hosted a mixer between city kids and members of the local police force. 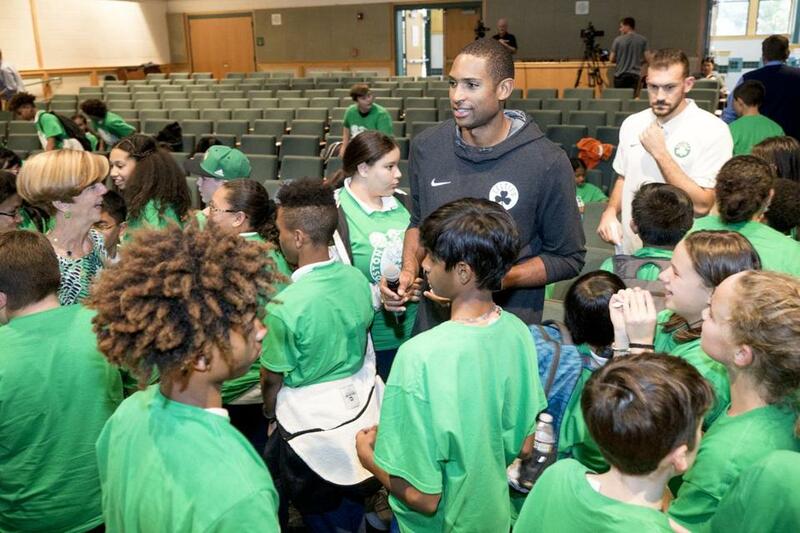 Horford, who played for the Atlanta Hawks before joining the Celtics, said he appreciates the opportunity to get to know some of the kids from Lawrence and North Andover over the course of their workshop series. The partnership will resume on Martin Luther King Jr. Day — Jan. 15 — with a visit to the Celtics’ practice facility in Waltham. “I think the concept is great,” said Horford, who was born in the Dominican Republic. “Integrating two schools from two different backgrounds, and the importance of working together, breaking down some barriers – it just caught my attention. When Smart — who’d been stuck in traffic — arrived, the coach and players sat on folding chairs on one side of the stage, next to a large presentation screen. On the other side, five green and white basketballs were placed on a table draped with a Celtics banner. Stevens, wearing jeans and loafers, told the students that his concept of leadership changed while he was studying the subject in a college classroom. “I thought leaders were the loudest, most imposing, most confident people,” he recalled. “I didn’t really understand that’s not what leadership is about. The best leaders in the world serve others. That was huge for me. “Every one of you has a special or unique talent. That’s the reason you’re in this room,” he said. After Hoffman conducted a word puzzle intended to inspire some thoughts about diversity, he asked the group about the lessons they’d learned from it. “When you think you know something, dive deeper to find out what it actually is,” said a boy named Kevin. “No detail is too small,” he said. Students respond to a question at the forum.